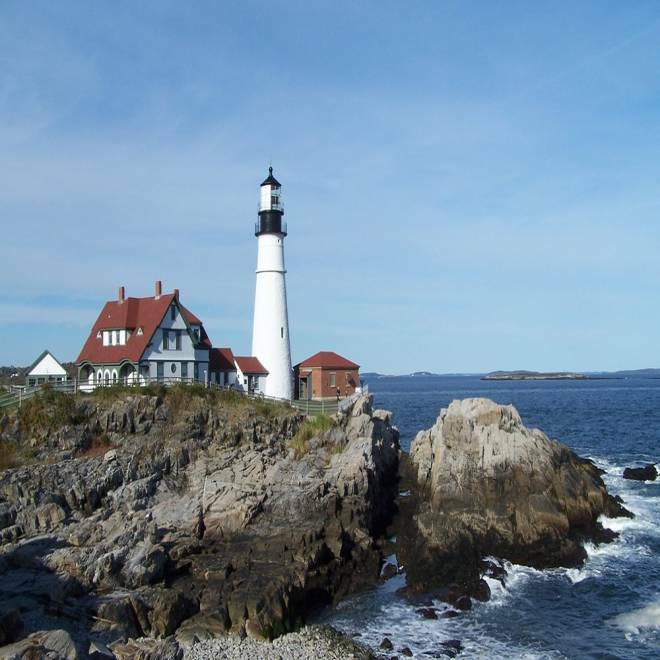 Portland Head Light stands at Cape Elizabeth, Maine, and was first lit on Jan. 10, 1791, using 16 whale oil lamps. Tanned bodies may catch the eye at the beach, but few seaside attractions capture the heart quite like lighthouses. “Lighthouses are to America what castles are to Europe,” said James Hyland, president of The Lighthouse Preservation Society, a nonprofit organization in Dover, N.H. Some people are drawn by their history, mystique and picturesque locations. For others, it’s all about what lighthouses symbolize. No matter what the appeal, this might be the perfect time for a visit. National Lighthouse Day is Aug. 7, marking the date in 1789 when Congress put lighthouses under the control of the federal government. To commemorate the occasion, many lighthouses are holding open houses, offering reduced or free admission, and showcasing new exhibits. From the East Coast to the West Coast, from the Great Lakes to the Florida Keys, there are hundreds of destinations to choose from. The best-known site may be the black-and-white-striped Cape Hatteras Light Station in North Carolina -- at 210 feet, the tallest brick lighthouse in the United States -- but everyone seems to have their favorites. Wheeler loves the Split Rock Lighthouse in Two Harbors, Minn. (motto: “Before GPS there was a really big light”), the Ponce de Leon Inlet Lighthouse in Ponce Inlet, Fla., and the Point Sur Light Station in Big Sur, Calif.
Hyland is fascinated by the imposing Navesink Lighthouse in Navesink, N.J.
About 1,800 light stations were built in the United States over the years, Wheeler said. The first began appearing in the 1700s to help guide the commerce of the day. With no planes, no automobiles and few trains, water was key to transporting people and goods. Lighthouses were essential in helping guide ships and warn of treacherous areas. Ship captains often used lighthouses as landmarks so the structures were painted in different colors and with stripes, spirals, or diamond patterns to make them look distinctive. Of the original structures, just over 600 remain, Wheeler said. Some are still in service, while others have been transformed into museums, bed & breakfasts, and hostels. The National Park Service keeps a list of historic lighthouses you can visit. Lighthouses can be square, round, conical, rectangular or octagonal, according to The Lighthouse Preservation Society, and often reflect the architectural styles of their day.